CDI provides three pig tracking receivers. 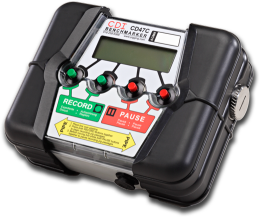 The CD42-R is CDI's well-established system which allows operators to monitor pipelines for industry-standard 22Hz transmitters (our transmitters or our competitor's). 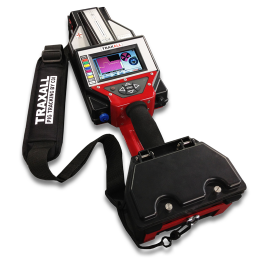 TRAXALL 770 and TRAXALL 720 allow 22Hz tracking also, but additionally allow our X-Series transmitters to be tracked using multiple color-coded frequencies. Our GeoEAR geophone provides simple and inexpensive day-to-day pig tracking using amplified audio. If you need assistance in selecting which device is best for you, please call our sales team at +1-918-258-6068, or email us by contacting us HERE. 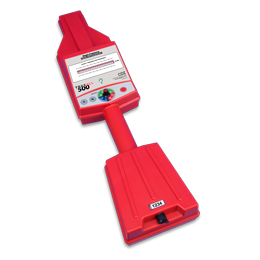 Track all of CDI's 22Hz transmitters, TRAXALL transmitters and MFL magnetizers as well. Simple and cost-effective pig tracking for 22Hz and TRAXALL multi-frequency. Complete kit with receiver, receiving antenna, cables, shoulder straps, manuals and carrying case. Perfect for any 22Hz transmitter pig tracking. Simple, durable and inexpensive daily pig tracking geophone system. Everything you need to track a moving pig is included. The "X-Series" family of transmitters are CDI's newest and most sophisticated and includes the X100-1N which is the smallest electromagnetic pig tracking transmitter in the world. These transmitters provide a better battery life to size ratio and are more compact than the T-Series transmitters below. In addition to the industry-standard 22Hz frequency, the X-Series transmitters can emit one of seven optional frequencies. When used with CDI's TRAXALL 770 receiver, these additional optional frequencies are color-coded which makes pig differentiation a simple matter. CDI's well-established "T-Series" of transmitters provides operators with a robust solution to everyday pig tracking. These transmitters mount on pigs 2" and larger and emit an industry-standard 22Hz electromagnetic frequency. Pluse patterns can be adjusted to provide a distinctive pattern and to conserve battery power. 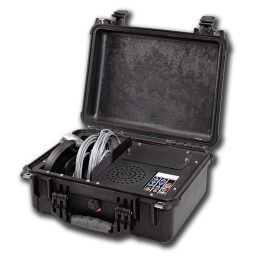 Track T-Series transmitters to 8,000 feet with CDI's CD42-STS pig location & tracking system. GPS equipped Above Ground Marker (AGM) which triggers on both MFL magnetizers and electromagnetic transmitters emitting 22Hz. Passage time accurate with within milliseconds per day.